Most people understand that exposure to lead, especially in children, can be extremely hazardous. 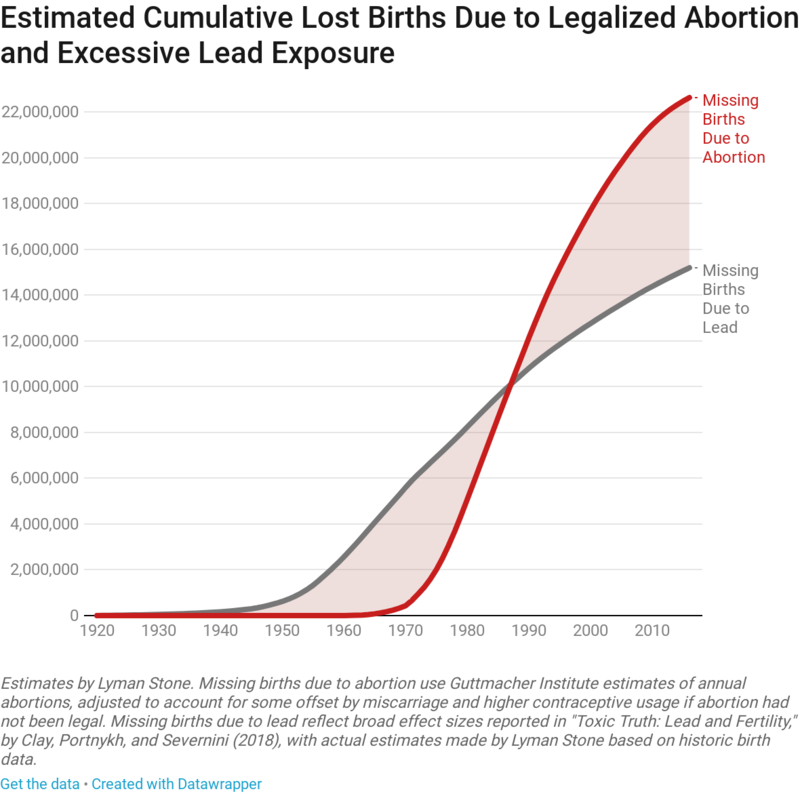 But one pernicious effect of lead exposure is not widely understood: It reduces biological fertility and increases the rate of fetal death and miscarriage. Lead pollution provides an entire suite of family planning services—everything from puberty delay to male and female fertility reduction to chemical abortion. Indeed, colonial-era commentators recommended lead as an abortifacient. In Flint, Michigan, lead pollution has increased fetal death by perhaps as much as 50 percent and reduced overall fertility by more than 10 percent. A study of a temporary lead spike in Washington, D.C. showed similar results: huge increases in fetal death rates and substantial declines in birth rates. But most people probably assume that, despite a few crises in a few places, their childbearing plans are safe from lead-related problems. Most people are wrong. Recently, a working paper titled “Toxic Truth: Lead and Fertility,” published by the National Bureau of Economic Research, used air-pollution data from the 1970s and 1980s to demonstrate that the presence of lead molecules in the air altered local fertility rates in those decades. Later, the reductions in lead emissions brought about by environmental regulations raised the national birth rate by about 6 percent. Lead had entered our air and water thanks to decades-old policy decisions permitting the use of lead in gasoline and water piping. Unfortunately, the switch to unleaded gasoline and lead-free piping hasn’t solved the problem. Lead molecules that once floated through the air and water have settled into our soil, ready to be released whenever you or your child dig in the mud or have a bonfire. Using soil-sample data from the 2000s, “Toxic Truth” shows that places with higher levels of lead concentration in the soil have lower fertility rates even today, decades after leaded gasoline was phased out. If every county that today has above-median lead-exposure levels in the soil were brought to median lead-exposure levels, national fertility would rise by about 4 percent. Though in previous decades the rates have been variable and widely disjunct, today lead pollution in the soil has an effect on childbearing comparable to that of abortion. Granted, some of the effect of lead occurs through prevented conception, rather than through the death of an unborn child. The intentional killing of the unborn will always deserve special moral abhorrence. But after intentional abortion, lead pollution is quite possibly one of the largest killers of the unborn. In terms of total effect, “Toxic Truth” shows that the estimated population-wide, causal effect of high lead exposure is similar in scale to accepted estimates of the population-wide, causal effect of the introduction of contraception. 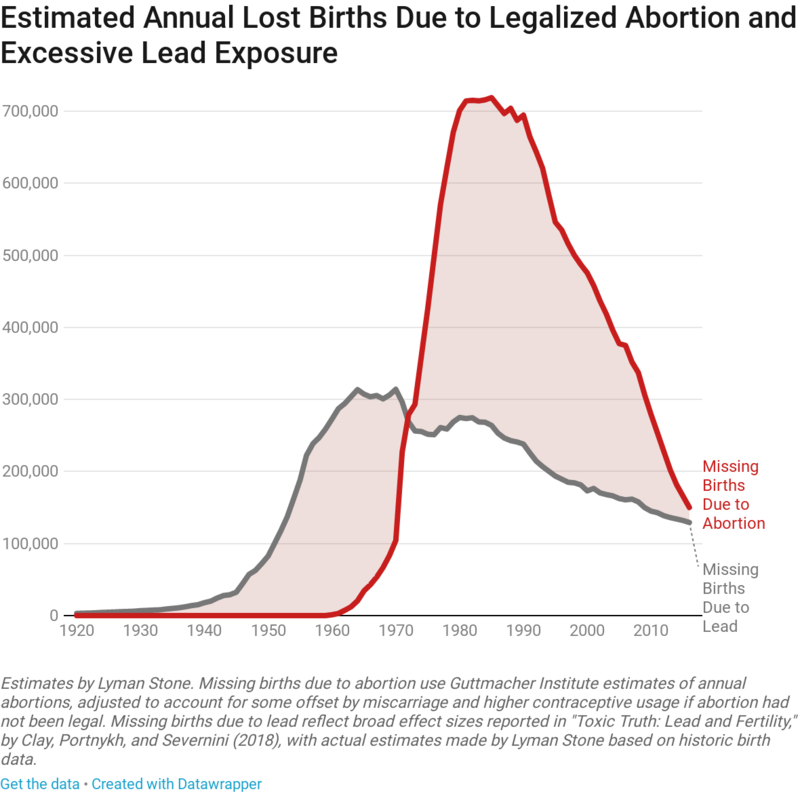 Lead exposure reshaped twentieth-century American fertility and childbearing nearly as dramatically as abortion or the pill, and its durable effect lingers to this day in poisoned soil. It is time for an aggressive national campaign of de-leading of soils, cleanup of hazardous waste sites, more extensive testing of lead content in the soil, and awareness campaigns in areas with high exposure to lead. Demands that the pro-life movement support this or that stylish cause vaguely tied to life are common, and sometimes offered in bad faith. But one thing is plain: Lead is killing our children. It’s time to get rid of it.